This is the cutest little girl set you ever did see! 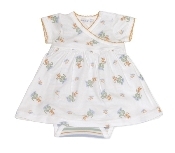 Made from 100% organic cotton, this set features a light - weight, knit cotton dress with a double snap at the collar and built - in bloomers that snap at the crotch for easy diaper changes. It has an adorable elephant pattern that remains consistent throughout the new spring line of Under the Nile products. The colors are the beautiful colors of nature.